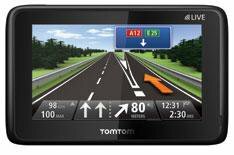 New top-of-the-range TomTom Go Live 1000 | What Car? TomTom has revealed a new top-of-the-range portable sat-nav system, which it says will get drivers to their destination easier, safer and smarter than ever before'. What Car? was at a special preview in Amsterdam to put the new unit through its paces on an initial test. The Go Live 1000 isn't just an upgraded Go Live 950 (the current range-topper) it's an entirely new device. A super-fast computer processor allows speedier route calculation, and a new touch-screen made of glass rather than the usual plastic offers improved sensitivity and better visibility in sunny conditions. A new magnetic connection means you simply hold the device against its windscreen mount and it sticks no need to faff around securing it in a plastic cradle. TomTom engineers have developed a new routing algorithm which, they say, sets new standards in accuracy and speed'. It also continuously scans the road network for faster routes and changes in traffic conditions. The Go Live 1000 has a redesigned menu system, too, which is a doddle to use and thoughtfully laid out. Although TomTom's Live services including HD Traffic, fuel prices and a local search powered by Google are available on some of the current devices, they've always been part of an 8 monthly subscription. Buy a Go Live 1000 and you'll get those services free of charge for 12 months. If you want to continue using them after that, you'll have to pay around 50 a year. Sat-navs have always been objects of functionality rather than desire. Until now, maybe. The slimline, matt black case has in TomTom's own words taken inspirational from the iPhone, and we reckon the Go Live 1000 wouldn't look out of place on the dashboard or windscreen of most premium cars. We'll thoroughly test the new TomTom against its rivals when it goes on sale in the summer, but our 20-minute play suggests the Go Live 1000 will fare pretty well. It's simply to use, quick to calculate routes, and the maps look more stylish and detailed than those installed on previous TomToms. If we have one criticism it's that the software seems a bit sluggish compared with that on other TomToms, but our test unit was a prototype and the 1000 will be fine-tuned before going into production. TomTom won't yet give us a clue on price, but said the device will be available with either full European mapping, or UK and Eire coverage only. Given that 12 months' subscription to TomTom's Live services will be included in the price, expect to pay from around 350.